Khan and his minister, Lakhpat Rai, again launched an all-out campaign against the Sikhs and set forth with a large army. The Sikhs were brought to bay in a dense bush near Kahnuwan, in the Gurdaspur district where they put up a determined fight. Overwhelmed by the superior numbers of the enemy they were scattered with heavy losses. The survivors were chased into the hills. Untold numbers were wounded and more than 7000 died. "To complete his revenge," wrote Syed Mohammad Latif, (another historian of the Punjab) "Lakhpat Rai brought 1000 Sikhs in irons to Lahore, having compelled them to ride on donkeys, bare-backed, he had them paraded in the bazars. Then they were taken to the horse-market outside Delhi Gate where they were beheaded one after another, without mercy." So indiscriminate and extensive was the killing that the campaign is known in Sikh history as the Chhota Ghalughara or the lesser holocaust only because a still larger massacre of Sikhs the Wadda Ghalughara ( greater holocaust) was to come later. 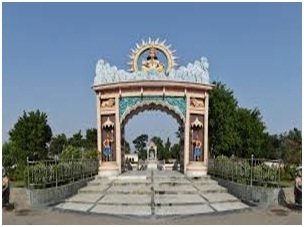 Pandori Dham Temple Mahantan is an ancient temple situated in Gurdaspur District. The temple was established about 500 years ago and was built by Aadi Guru Bhagwan Ji. With thousands of devotees and tourists visiting this place, Pandori Dham Temple has become the biggest temple in the district of Gurdaspur. The temple is a Vaishnava establishment at Pindori, which is a notable structure of influence and of historic significance. The fame and eminence of Pandori Dham temple is not just conceded in Gurdaspur District of Punjab. Far more than its share of religious importance, the temple attracts historians and heritage seekers too to this place from all over the world. The gaddi at Pandori also finds prominent reference in ancient Vaishnava records. Village Gurdas Nangal which is associated with Banda Singh Bahadar’s last battle with Mugals is situated about 7 kilometers (4 miles) west of Gurdaspur City. Bhai Duni Chand’s Haveli earlier known as BANDE WALI THEH is about one mile from the present village of Gurdas Nangal. A brief life history of Banda Singh Bahadur is written on a huge board and is displayed in front of Gurudwara.